Digestive Enzymes Supplement | Digestive Health Benefits | Get Here! Helps the body absorb all food groups. Contains natural enzymes and compounds traditionally recognised for aiding digestive health (aniseed, ginger, peppermint). 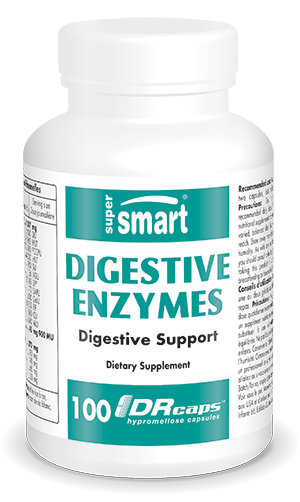 Our product Digestive Enzymes is formulated to aid digestion. It contains natural digestive enzymes, molecules produced by the pancreas which enable the body to digest and absorb each food group. Though digestive enzymes are naturally present in the body, levels decline with age, resulting in potential deficiency which can manifest in metabolic dysfunction and discomfort. Supplementation can thus prevent such deficiency and restore digestive enzymes to normal levels. phytase, an enzyme that converts phytates, specific forms of phosphorus found in plants, some of which cannot be digested as such, like phytic acid. ginger, which is recognised as aiding digestion and having anti-emetic properties, ie, it combats nausea and vomiting. Designed to improve digestion, our digestive enzyme supplement thus combines a broad spectrum of enzymes with a range of synergistic phytonutrients, to help you digest food. It comes in capsule form with a suggested dose of one to two capsules to be taken just before meals. Other ingredients: Rice bran, sodium benzoate, potassium sorbate. Take one or two capsules just before each meal, depending on the size of the meal.